On our last day in Paris our Eurostar train didn't leave until gone 5o'clock. With heavy backpacks to carry around we needed somewhere to spend the afternoon in a leisurely manner. 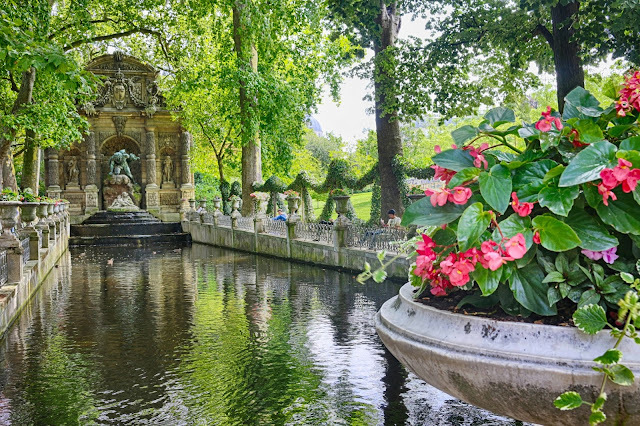 Over breakfast I had a look through the guidebook and came across the Jardin du Luxembourg. It wasn't far from the Odéon Metro station which in turn was on the same line as the Gard du Nord for our departure back to London. It was warm day so off to the park we went. The guidebook described it as Paris' most gorgeous park. I wouldn't call it gorgeous myself but there certainly are some very nice parts to it. The park is essentially the gardens of the Luxembourg Palace and the grounds are free to enter for the public. 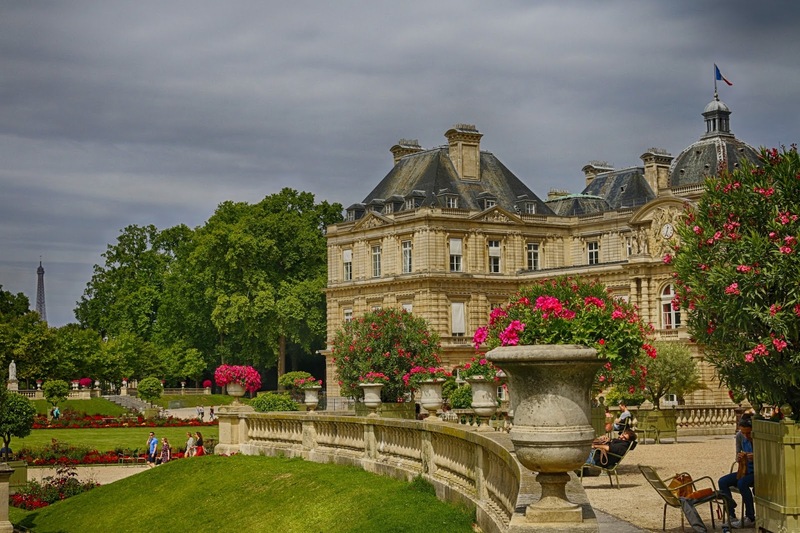 The palace was built by the widow of King Henry IV, Marie de' Medici in 1611. 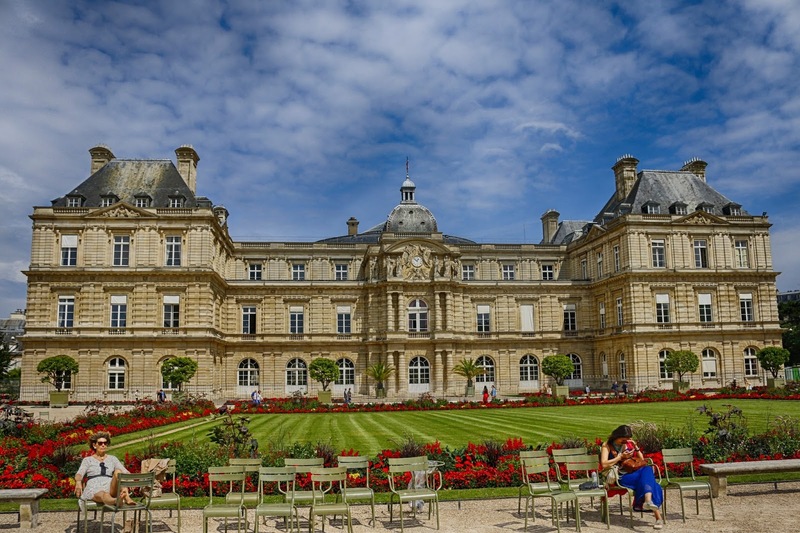 Since 1958 the palace has been used by the French Senate, the upper house of parliament, as their meeting palace. 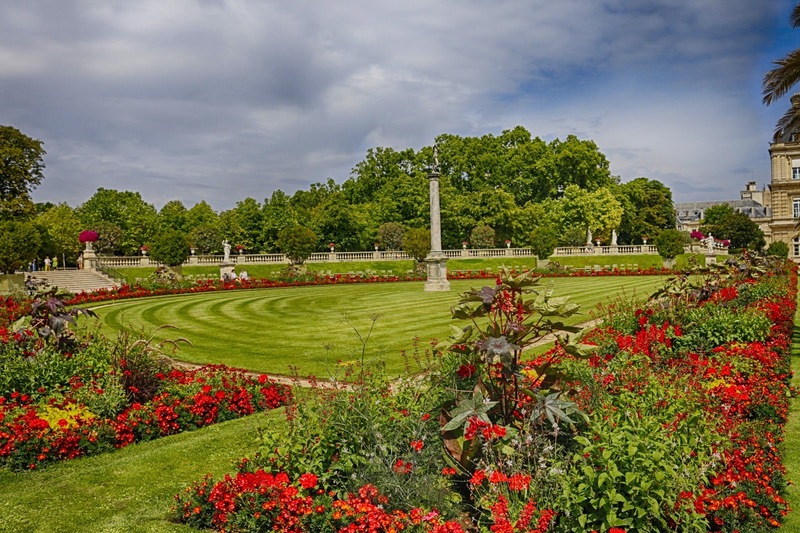 The layout of the original gardens was the first in France to be inspired by the Italian Baroque style. 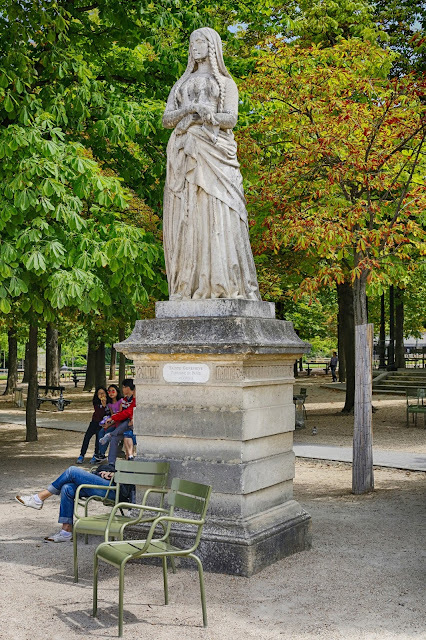 Marie had spent her youth at the Boboli Gardens in Florence. The current planting around the boating lake is based on a red and green colour scheme. Red stalked chard had also be used in conjunction with more traditional border planting. One of the main focal points of the garden is the Medici Fountain. 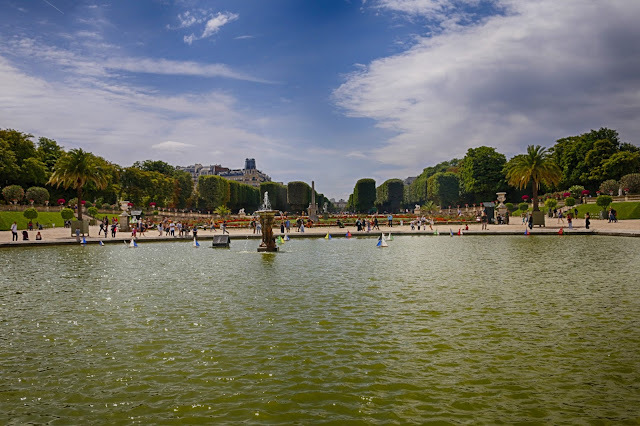 It has been moved around the park over the years and given enhancements such as the long basin of water. Judging by the amount of people posing for photographs and taking selfies it is probably the most popular spot for tourists. 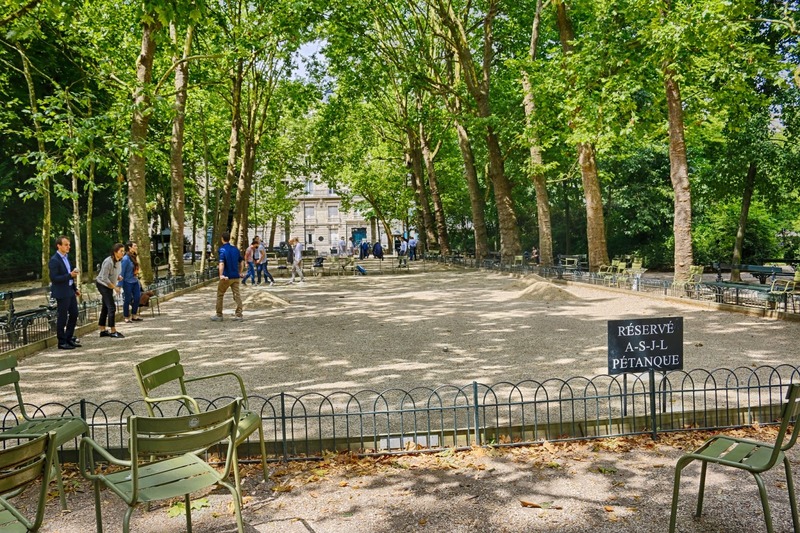 Elsewhere the Jardin du Luxembourg is the place to get a feel of how Parisians spend their leisure time. This can range from a eating a takeaway salad on a bench to a lunchtime game of pétanque. 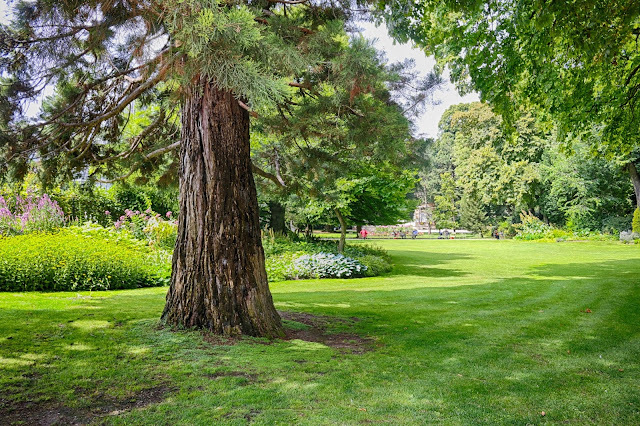 The summer heat of late July and August sends many Parisians out of the city but for those who have to stay the gardens provides welcome shelter from the heat. Wherever you are in the gardens you'll be able to see a sculpture. 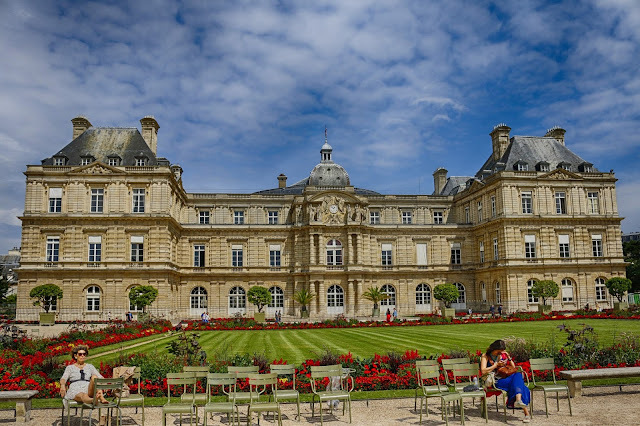 It is home to over 100 figures of which unusually many are women in the form of French queens and other noble figures. 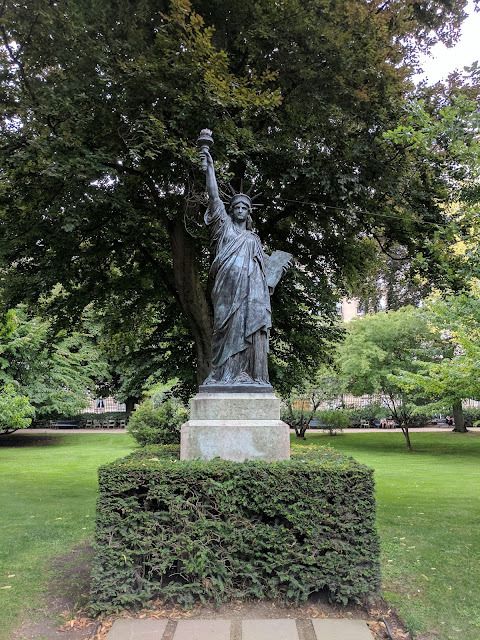 While most of the statues are unique in their composition there is also a miniature version of the Statue of Liberty. This isn't actually the original one either as the one crafted in 1900 was placed at the entrance of the Musée d'Orsay in 2014. One thing I noticed and took advantage of throughout the gardens is the abundance of metal chairs. They are free to sit on and comprise straight-backed plus also recliners. They are not fixed and can be moved around as people wish. I was astonished they hadn't been taken off elsewhere!